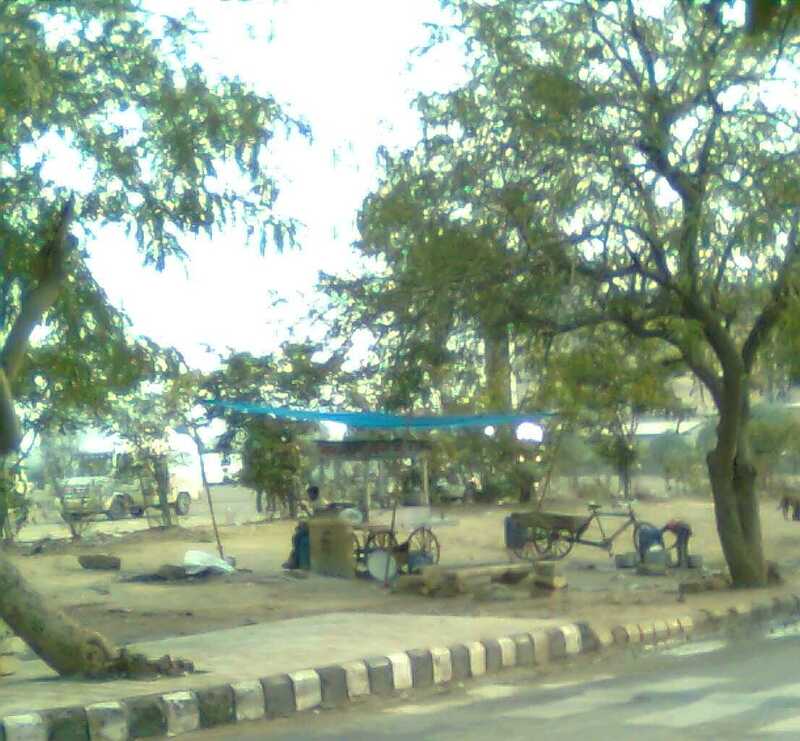 The daytime weather is nice in Delhi these days, but it won't be for long. So before things really heat up, why not take a green outing with the family? 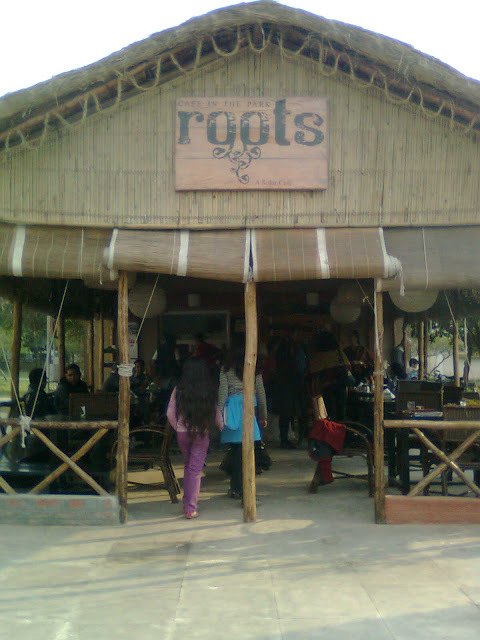 A few weeks back, we headed out to Roots cafe in the Rajiv Gandhi Renewable Energy Park, Gurgaon--and we had a great time. I confess, I normally avoid Gurgaon. For one thing, I don't like giant malls, and for another, I don't like traffic. But the metro makes the traffic a non-issue, and the Cafe Roots is not a giant mall. Just hop on the Yellow line and head to the IFFCO Chowk stop. It's something like 30 minutes from Hauz Khaz station, and it's an interesting ride: once the metro comes above ground, you get all kinds of interesting views out there. He'll tell you to keep walking and pretty soon you'll come to the RGREP. 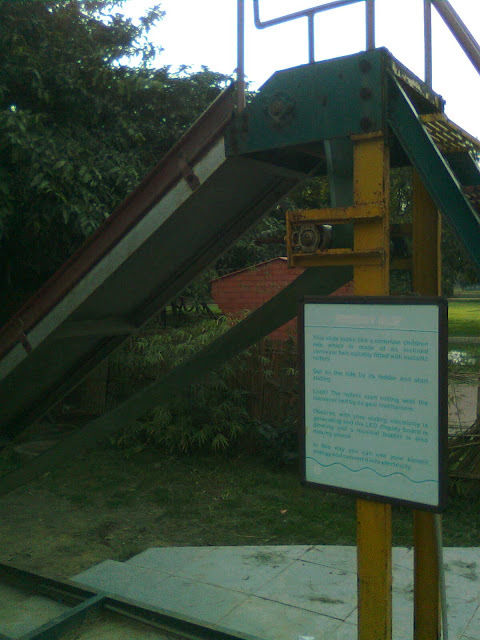 It's run by Haryana Renewable Energy Development Authority (HAREDA), and it's goal is to spread awareness about sustainable development. Does it work as a government agency? I have no idea whatsoever, but you can do some research by reading their annual report, or checking out their website. It may be a complete waste of money, or it may be wonderful. My goal was to find out if the kids would have fun in the park, and if Roots Cafe was any good. And the answer to both of those questions was a resounding yes. I once wrote a post about how my kids like to imagine crazy ways to get electricity from playground equipment. This park actually takes those kind of ideas off the drawing board and makes them real...sort of. The slide above was supposed to generate enough electricity to make a light light up, but it wasn't working the day we went. 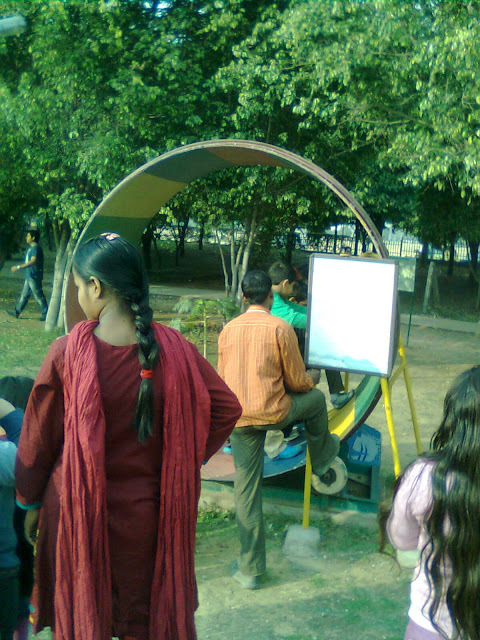 However, this crazy spinning machine did light up lights and make cool noises when kids ran in it. A little bit like something you might find in an enormous green hamster cage. The kids and I concluded that it probably won't be revolutionizing the power grid anytime soon, but it was pretty cool, nonetheless. Like solar arrays and solar water heaters. There was even a solar powered battery car you could rent, but the Batti kids are skeptical about any form of private motor vehicle and they didn't feel the car was worth the Rs. 20 or whatever was being charged. While the kids played, Mrs. Batti and I sipped some tea at Roots. Roots--'a cafe in the park' has a lot going for it. No AC, for one thing, which is necessary in a green cafe. Of course it will get warm in the summer months, when most of us stay inside during the hot hours. But those of us who have learned to live 'AC Free' in Delhi know that shade, moving air, and a little good old fashioned sweat are really all you need to be comfortable on most days--and this cafe has all of those things. The food we ordered was good. Roots does not qualify as one of our Best Dhabas in Delhi, but I liked the fact that it's menu included reasonably priced items. For example, the masala chai was excellent and a generous sized cup sold for Rs. 20, just a few rupees more than the metro fare it took to get there. Roots is a private cafe, with a contract to run in a quasi-governmental space; it is not a revolutionary green organisation. Still, one gets the feeling that it is run by good people. Someone told me that the owner travels only by metro now, and that didn't surprise me. So if you need something to do on a weekend and are sick of Cafe Coffee Day and all that noise, why not jump on the Yellow line and go check out Roots? I don't think you'll be disappointed. 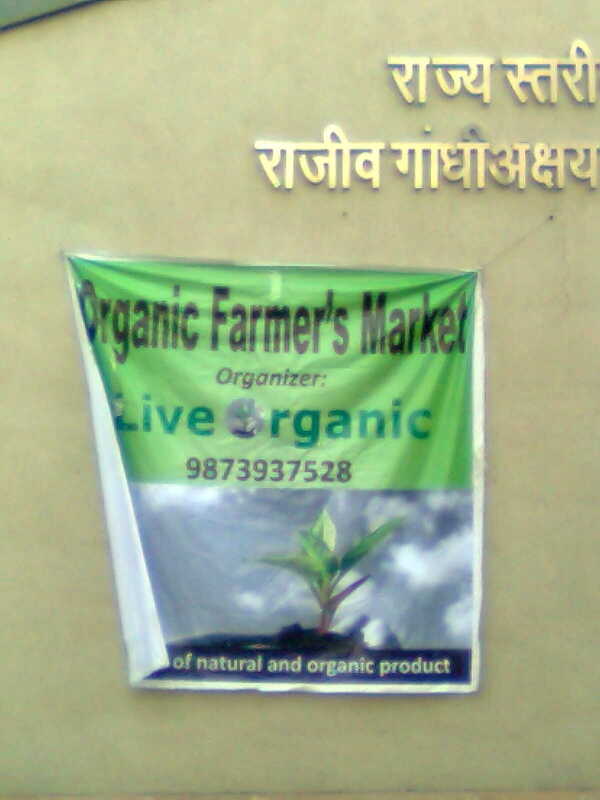 For more information, you can check out their Facebook group. And if you go on Sunday, you might be able to find some good organic produce at the farmer's market. 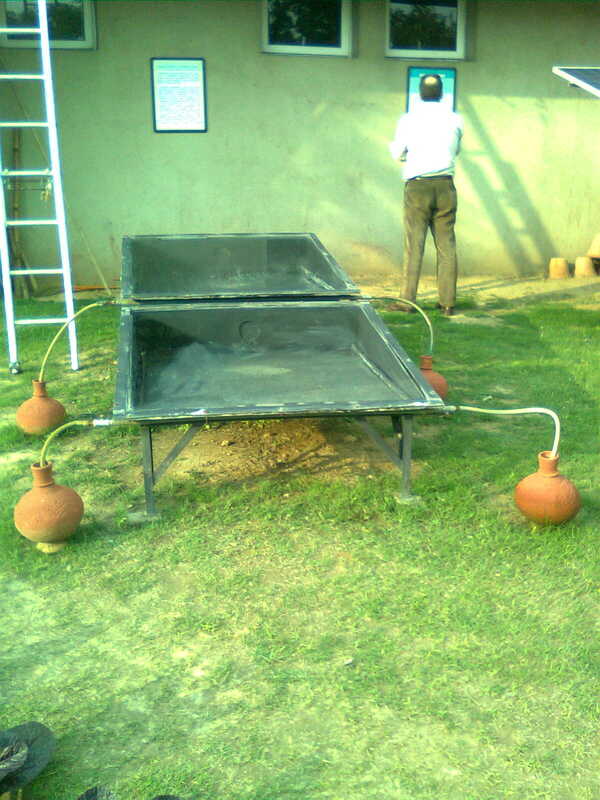 For more interesting places to eat, check out out Best Dhaba in Delhi series. 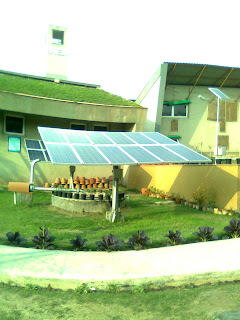 This Rajiv Gandhi renewable Energy Park is run by Advit FOundation, an NGO based in Gurgaon. a big congratulations to them.